As I try to code an entity that can be picked up and placed, I find myself becoming somewhat overwhelmed by all the cases I'd have to test for to ensure that the hero behaves correctly as though the 'carrying' state is set. Not only do I have to make sure the entity works, but also the hero itself. I find that it would be much simpler if it was possible to turn an entity into a carried_object, having it fire events when lifted, when released/thrown/placed/whatever, and when destroyed... If those were accessible it would be somewhat trivial to create a variety of non-standard liftables, such as those that are placed gently when let go, those that are thrown but don't explode, and even some that are destroyed immediately upon being lifted (if that was needed). Not being able to access the hero's state directly, or pass an entity to the hero as a carried_object reference, largely prevents me from doing that. Hard-coding all of that behavior wouldn't be necessary, as that could largely be handled by custom_entity scripting, if it was possible tell the hero that the entity should be carried. I feel like there are a lot of built in features that would be a lot more flexible if they had some more lua control, but most of those features can be recreated to an extent using items or entities... lifting and carrying seems to be a much more complicated problem on the other hand. But as the title states, this is less a formal request and more of a suggestion for how the engine might be more flexible. Some engines also have a variant of additive that is subtractive ( (-1*source) +destination )** which is sort of similar in effect to multiply, but applied differently and with different side effects... (still used usually for the same goal, darkening). the four modes Christopho added were predefined by the SDL library. It would likely require a much deeper amount of digging into that to supply a custom blend mode. Not to say it wouldn't be a neat feature, but it would likely be more difficult to implement. **There are also 'power' /'exponent' and 'divide' modes... none of which I've ever actually seen used outside of purely mathematic calculations. shadow_surface:set_blend_mode("color_modulate")Gets really close to it. And yeah, your sunrise/set look pretty rich and nice. Development / Re: Checking if the hero is overlapping an entity with a compatible name ? Its doing both e:return_no_effect() and e:on_zelda_lullaby_interaction() because you're checking all entities that have those functions. That's assuming you've programmed your ocarina_zelda entities correctly, and there's no problems with your search. What I would do, is make the ocarina_zelda_whatever entities do a collision test, and in that collision test, check to see of the hero is using the ocarina. There's a number of things that might be going wrong. First of all, if return_no_effect() doesn't do anything, just remove your else altogether. I think most likely the Else is what's screwing you up, as I understand your statement. But lets say you need to track the event that the Hero isn't overlapping ANY such entity, and return a message that says nothing happened. It depends. What effect are you trying to achieve? If you want the daytime to be bright, set the surface to pure white, and it will not be darkened at all. if you want the scene to turn blue, set the color to (0,0,255,255). The reason to use modulate blending is to darken the scene without making it look smokey and desaturated, like what happens when you just use a regular semitransparent solid color on top of it. That is, if you used a dark color, with blend mode Blend, at 50% transparent, the blacks would lighten and the lights would darken. With color_modulate the darks stay dark, but the lights get darker too. With additive, the lights stay light, and the darks get lighter, but colors stay bright, instead of being washed out, like the same that happens in the previous example. Color choice is really important with blend modes. Additive blend is really good for things like fire and light beams and mirages, modulate is better for things like shadows and color tinting. a lot of neat effects can be gained by drawing surfaces with different blend modes onto each other, before finally rendering them on the screen. This is exactly what I hoped for. Keeping that in mind, you just have to imagine whether you want to make something darker (by making the numbers smaller, by multiplying their percentages) or brighter (by adding them together). *Note that trying to change the blend mode on [map:on_draw(scene_surface)] directly, it doesn't seem to have an effect. Development / Re: Lifting a custom_entity? Alright thanks for the reply. I'll start thinking about how I need this to work. Welp... Its a good thing I wasn't doing this a year ago, or I'd never have understood lua well enough to do any of it. Despite all the trouble I'm having with custom entity code, I'm actually getting some cool stuff done, from a framework perspective. ...oh well. Back to work with me. Development / Lifting a custom_entity? Am I going to have to code everything from the lifting to the walking, and placing/throwing manually? For the first time in a while I'm 100% stumped as to how to proceed. Development / Re: How can I change the Hero's Layer? I think you are changing the position of your custom entity instead of the position of the hero, i.e., the collision test is probably detecting the custom entity as colliding with itself, so the layer of the custom entity is changed and then there is no collision with the hero since they are in different layers. I might be wrong with this, so you have to check if this is what is happening. In that case, you will need to add a condition in the collision test to check that the other entity is the hero, something like: "if other:get_type() == "hero" then ....blablabla". Anyway, as Starlock says, the simplest way is probably to use a sensor instead of a custom entity with a collision test, unless you need to make more things that cannot be done with a sensor entity. EDIT: Another possible cause of your problem could be if the ground on the second layer is of type "empty". That would make the hero fall automatically to the low layer again, because that is the behavior coded in the engine. However, other entities do not fall to lower layers if they are over an "empty" ground, so this would explain your problem too. I had not considered that empty tiles would automatically cause the player to fall. That seems to be the most likely case here, as the second layer is empty. As for the entity colliding with itself, it is not. I've tested that already, 'other' is appropriately the Hero, and also works on other entities like blocks and destructibles. Now that I've tested it with appropriate flooring installed, the hero does in fact move up to the second layer. I'm attempting to create a stackable entities...I have my reasons. Now... this all works as it seems like it should, except that it does not change the layer. and the hero does move to whatever hero x and hero y are, but new layer is ignored. In short, hero:set_position() is ignoring the layer no matter what I do... is there another way to handle layer switching? Other entities that move across this layerswitch entity DO get their layer's changed... Only the hero is ignored. Development / Re: Help: how to get a non rectangular region of a surface? if I understood the whole C++/lua interface thing I'd try my hand at making an unofficial branch with the feature, but alas, I don't get the C++ end at all. It'll be up to Christopho to add the lua function, whenever or if ever he does that. A different option is required until then... I tried making a big lua table of filled and empty 'darkness' tiles and looping through them each frame, drawing them into the surface... which... kind of worked... but not well... and also caused a lot of lag... I'm still hopeful there is a method that will work... but I get the feeling it'll require some heady math. I'll let you know if I come up with any more ideas you can try. technically those are still rectangles. You could get them in the same way you would get the yellow parts, but just imagining where the connecting lines would be between them. 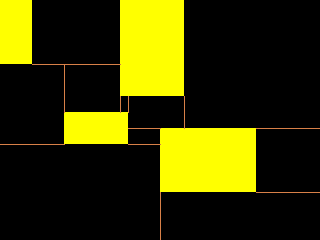 Draw the biggest black rectangle you can find in the non-yellow space, and where there's an oddly shaped corner, fill it in with another separate rectangle. If you're doing a 'lighting' script, where yellow spaces would be lights you want to 'cut out' of the blackness, I might have to rethink how to do that.. its something I've been wanting to try too. Maybe that helps maybe not. Get back to us if you come up with something that does, I'd like to see it. A carried object is created automatically by the engine when the hero lifts a map entity. Map entities that can be lifted include destructible objects and bombs. The carried object takes the sprite and the features of the lifted entity it is created from. The hero can then walk with his carried object and throw it. He can even go to another map: the carried object is preserved. I tried this by creating a destructible object, and carried it to a teletransporter into the next map, but when I arrived at the next map, there was no longer an item being carried and the character's state has been set back to "free" rather than "carrying". Is this a bug, or ambiguity on the part of the documentation?